I am a Ph.D. student studying plant physiological ecology within Dr. Richard Thomas' lab. 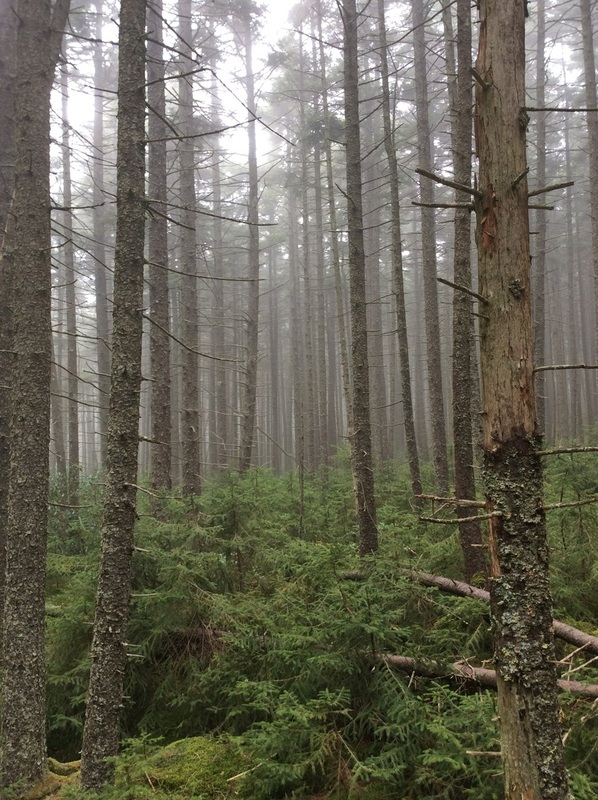 Red spruce stand in the central Appalachian Mountains. Anthropogenic disturbances are severely altering Earth’s atmosphere—land use change and fossil fuel burning contribute to increasing atmospheric CO2, SO2 and NOx. While elevated levels of CO2 have the potential to be an aerial fertilizer for forests, SO2 and NOx undergo various reactions in the atmosphere and return to the biosphere as strong acids where they are detrimental to forest health and productivity. Following the Clean Air Act of 1970, and its subsequent amendments in 1990, levels of pollutant emissions of SO2 and NOx began to rapidly decline. However, both the time required for and degree to which forest ecosystems recover from the negative effects of pollutant emissions remains unknown. For this project, I am employing a suite of dendroisotopic and physiological techniques to gain a better understanding of how forest ecosystems in the central Appalachians respond to reductions in pollutant emissions. Locations of study sites along a gradient of N deposition throughout the central Appalachians. Since the amendment of the Clean Air Act in 1990, atmospheric nitrogen (N) deposition has been declining in the northeastern United States; however, rates of deposition remain higher than those during preindustrial times. Nitrogen deposition can have severe impacts on forest health and productivity and plays a pivotal role in the global carbon cycle. However, terrestrial forest ecosystem responses to N deposition vary based upon the duration and intensity of exposure. In many temperate forest ecosystems, N is often the nutrient that most limits net primary productivity (NPP), therefore forest growth and ultimately carbon sequestration are largely determined by the amount of available N in soils. Acting as an aerial fertilizer, atmospheric N deposition can increase N availability, alleviating growth limitations and potentially mitigating some of the negative effects of climate change. While we know how nitrogen deposition influences many aspects of terrestrial forest ecosystems, it is less clear how deposition impacts rates of soil N transformations and, in particular, how pools of available nitrogen may be altered. Over the past few years, this research has elucidated the influences over rates of N transformations in central Appalachia. Study transects in the US and China. Current studies defining N availability in forest ecosystems rely heavily on a few well- established methods for determining rates of N cycling such as the buried bag technique, use of intact soil cores, and lab incubations. However, these studies only provide insight into N cycling for an ecosystem’s present state, and often have limited spatial resolution. Of particular interest is how N dynamics have changed through time, a question that is impossible to address without long-term data or temporal understanding of forest dynamics. Plant δ15N values often correlate with local N dynamics and as well as other environmental influences; however, studies examining these relationships rely on the signals found primarily in plant roots or foliage. To date, few studies have investigated δ15N signals in tree rings, with those that have obtaining various results. Some attribute variations in observed signals to regional environmental pollution and perturbations, while others suggest local influences—such as N transformations—of a particular ecosystem exert a greater influence over δ15N signals than regional scale effects such as N deposition. It's clear there can be distinct influences over δ15N signals in tree rings; however, the causes of these variations are not well understood. To better understand the influences over tree wood δ15N, this project will compare tree rings from transects in deciduous forests of eastern United States and eastern China--similar forest ecosystems in terms of structure and function, but with widely differing histories on air pollution, providing distinct differences in historical N signals that may be recorded in tree rings. A red cedar core from a stand in the central Appalachians. From a single leaf to whole ecosystems, there is an inextricable link between the C and N cycles and understanding this relationship is key to predictions of future forest C cycling. The relationship between leaf photosynthesis and leaf N content is robust across a large number of species and a broad range of ecosystems and process-based models use this fundamental relationship to predict carbon flux in forest ecosystems. During photosynthesis, there is predictable discrimination against heavier C isotopes, which provides successful estimates of C assimilation in temperate forest ecosystems through time. Less clear, however, is whether stand N dynamics are recorded in stable N isotopes in tree wood. Thus, this project aims to examine the nature of the relationships between δ13C and δ15N in tree wood through time.